1. the transfer of information. 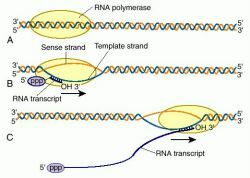 2. the synthesis of RNA using a DNA template catalyzed by an RNA polymerase; the base sequences of the RNA and the DNA template are complementary. order transcription in the nursing interventions classification, a nursing intervention defined as transferring information from order sheets to the nursing patient care planning and documentation system. (tran-skrip'shŭn), Avoid the misspelling transscription. Transfer of genetic code information from one kind of nucleic acid to another, especially with reference to the process by which a base sequence of messenger RNA is synthesized (by an RNA polymerase) on a template of complementary DNA. /trans·crip·tion/ (-krip´shun) the synthesis of RNA using a DNA template catalyzed by RNA polymerase; the base sequences of the RNA and DNA are complementary. Transcription. Binding of the RNA polymerase at a specific site on DNA to be transcribed (A) is followed by unwinding of a region of the DNA helix and initiation of transcription in a 5′ to 3′ direction (B), producing an RNA transcript complementary to, and hydrogen-bonded with, the template strand of the DNA. The transcript elongates as the polymerase proceeds down the DNA (C), helix unwinding before and rewinding after it. 1. The act or process of transcribing. 2. Genetics The synthesis of messenger RNA from a DNA template through the formation of base pairs, resulting in a transfer of genetic information that codes for amino acid sequences composing proteins. the process by which messenger RNA is formed from a DNA template. See also anticodon, genetic code. The process of transforming dictated or otherwise documented information from one medium (e.g., audiotapes, clinical letters, source documents, lab instruments, case report forms (CRFs) and so on) to another (e.g., electronic CRFs). 1. Transfer of genetic code information from one kind of nucleic acid to another, especially with reference to the process by which a base sequence of messenger RNA is synthesized (by an RNA polymerase) on a template of complementary DNA. 2. Process in which medical transcriptionists convert dictated health care information into a printable document. The synthesis of RNA on a DNA template. Fig. 301 Transcription . Uracil replaces thymine in the RNA stage. See genetic code for details of triplets. (a) the DNA double helix unwinds. (b) only one DNA POLYNUCLEOTIDE CHAIN serves as a template (the CODING STRAND or sense strand) in any one region, although both chains will act as templates in different locations. (c) the enzyme RNA polymerase catalyses the synthesis of an RNA molecule from RIBONUCLEOTIDES with bases complementary to the DNA base sequence, starting at the transcription start site on DNA. Growth of the RNA chain is from 5′ to 3′, the same as in DNA synthesis. (d) transcription continues until a transcription terminator signal is reached. (e) in eukaryotes the new RNA molecule (transcript) leaves the DNA of the nucleus and moves to the cytoplasm, where it will function as TRANSFER RNA, MESSENGER RNA or RIBOSOMAL RNA. In prokaryotes the new RNA molecule is synthesized in the cytoplasm. (f) the two chains of the DNA molecule reanneal to restore the duplex as transcription proceeds. the synthesis of an RNA copy from a nucleotide sequence in a limited region of DNA. See also deoxyribonucleic acid and transcriptase. the cis-acting DNA sequences regulating transcription of a specific gene. a general term for any protein, other than RNA polymerase, required to initiate or regulate transcription in eukaryotic cells. General TFs are involved in the formation of the transcription-preinitiation complexes near the start site and are required for transcription of all genes; specific TFs stimulate (activators) or inhibit (suppressors) transcription of particular genes by binding to their regulatory sequences. a hallmark of the replication strategy of coronaviruses, toroviruses and arteriviruses, in which a nested set of subgenomic mRNAs are generated having identical 5′-leader sequences and a common 3′-termini, but because of discontinuous transcription each mRNA has a unique coding sequence and is transcribed into a unique viral protein. the synthesis of a DNA copy from a RNA template, catalyzed by reverse transcriptase. The Dragon NaturallySpeaking SDK Server Edition will allow healthcare information systems vendors, manual transcription service organizations and systems integrators to deliver real cost and efficiency savings to their customers, which ultimately translates to better patient care. Two independent AP-1 reporter clones (A3 and A9) also showed concentration-dependent activation of AP-1-dependent transcription in response to TPA or EGF treatment (Figure 3A, B). For example, variations in virulence of Listeria monocytogenes serotypes have been correlated with differential transcription of PrfA-regulated virulence genes (67, 68). The Swifts hired an employee and embarked on a goal to capture all the Spokane transcription work that was being sent to out-of-state companies. In this paper, in order to clarify the relationship between molding conditions and transcription quantitatively, and estimate the extent of transcription height, the transcription of minute rectangular grooves (width 0. For more information about the Caliber professional transcription headset, visit www. Founded in 2010, Transcription Outsourcing, LLC is a Denver, Colorado-based law enforcement, legal, and medical transcription company that provides fast, accurate and reliable transcription services. The inventions covered by this patent (United States Patent 6,453,242) are the result of research by Sangamo scientists into improving the affinity and specificity of DNA binding by engineered zinc finger transcription factors. In comparison with other transcriptions of Bach's music, the level of difficulty is considerably greater in the Godowsky versions. Site-directed mutagenesis of the glucocorticoid response unit essentially abolished both the Dex response and the arsenite effect, suggesting a direct role for the glucocorticoid receptor (GR) and transcription in the arsenite response. Acting as genetic light switches are proteins known as transcription factors, many of which physically latch onto DNA to exert their influence.